China's Air Pollution Linked To Millions Of Early Deaths : Shots - Health News About 1.2 million people die prematurely every year in China from exposure to outdoor air pollution. Smog has dogged the country as it grows at an explosive rate and burns huge quantities of fossil fuels. But there are signs that the government is beginning to take the issue more seriously. More than 1 million people are dying prematurely every year from air pollution in China, according to a new analysis. "This is the highest toll in the world and it really reflects the very high levels of air pollution that exist in China today," says Robert O'Keefe of the Health Effects Institute in Boston, who presented the findings in Beijing this week. Alarm has been growing in recent years about the air in China. On many days in many cities, it's thick with smog. "When you get off the airplane, if you were to travel to Beijing, you would immediately feel your eyes stinging and your throat rasping," says Barbara Finamore, director of the Natural Resources Defense Council's China program based in Beijing. It's so bad that people commonly walk the streets wearing masks. Parents won't let their kids play outside. "There are many days where we cannot see the building across the street," she says. "It's a pea soup of pollution." O'Keefe and other researchers decided to take a closer look at a massive report about the world's health problems that was released in December by the journal The Lancet. 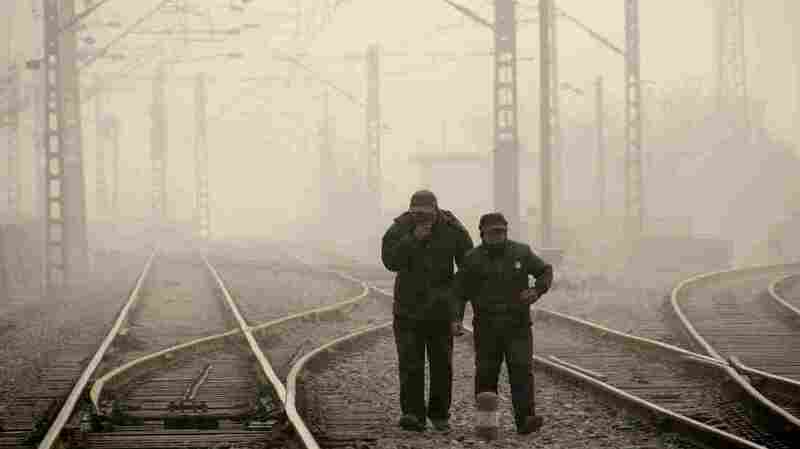 They found that in China, approximately 1.2 million people die prematurely from exposure to outdoor air pollution. In fact, about two-thirds of all the deaths from air pollution are now occurring in Asia, most of them in China. And air pollution has become the fourth leading cause of death in China. "For the most part, the air pollution effects are generally manifested in frail populations — people with asthma are generally more susceptible to the effects of air pollution," O'Keefe says. "Also the very young and children who live in highly polluted areas for extended periods of time." These photos of Beijing's Tiananmen Square, taken just one day apart, show how stifling pollution has plagued the region. The main reason air pollution is such a huge and growing problem is clear: China's explosive growth. "Cars are being added and trucks are being added to the streets in major cities at record numbers. Power plants burn significant amounts of very low-grade coal, and the energy consumption in China is rising dramatically." O'Keefe says. But he says there are hints the government is starting to take the issue more seriously. Just the fact that the government allowed O'Keefe to present his report at an open forum in the nation's capital is promising, he says. "There was a large amount of Chinese media there. I was very encouraged by that," he says. "And I think it's another signal that the government is serious about beginning to engage on this very significant public health problem." The government also recently started doing something else to acknowledge the problem. "They've put in place — and this is quite remarkable — a nationwide monitoring network that is reporting, in real time, levels of air pollution," O'Keefe says. "So for the first time the Chinese government is providing transparent levels of air pollution that the public can actually see." Others agree that the new public monitoring system is a sign of progress. Only a few years ago, people just didn't realize what was happening. "I remember going down the street and people saying, 'Very foggy day today,' " Finamore says. "They didn't recognize that it was smog and certainly deadly smog until that information started becoming available on a real-time basis." Finamore is encouraged by other steps the government is taking, including efforts to clean up exhaust from cars and trucks and cut sulfur dioxide from coal-fired power plants in half. "So I think the tide has turned in China. The government recognizes that the people are demanding cleaner air, cleaner water, cleaner food. And they have at least said they are going to do something about it," she says. But Finamore says the key will be whether the government follows through on its promises to start cleaning up China's filthy air.